In recent decades, untold numbers of people have left the Roman Catholic Church. In a 2008 survey, Pew research found that one in 10 Americans now considers themselves an ex-Catholic. The situation is so dire that the church launched a PR campaign inviting Catholics to “come home,” to woo back disgruntled members. There was a slight uptick in Catholic membership last year, mostly due to immigrant Catholics. There is no data indicating that Catholics are returning en masse and much anecdotal evidence suggesting that leaving-taking continues. Catholic leaders worry that once the new immigrants become fully part of American society they might leave, too. The end of church, however, is not merely a Catholic problem. For decades, mainline Protestants have watched helplessly as their membership rolls dwindled, employing program after program to try to stop the decline. In the last 15 years, conservative Protestant denominations have witnessed significant erosions in membership, money and participation — with some of the greatest drops in groups like the Southern Baptist Convention that once seemed impervious to decline. In a typical week, less than a quarter of Americans attend a religious service, down from the half of the population who were regular churchgoers a generation ago. There are successful individual congregations — Catholic or Protestant, mainline or evangelical, liberal or conservative, small or large — everywhere. But the institutional structures of American religion — denominations of all theological sorts — are in a free-fall. The religious market collapse has happened with astonishing speed. In 1999, when survey takers asked Americans “Do you consider yourself spiritual or religious,” a solid majority of 54 percent responded that they were “religious but not spiritual.” By 2009, only 9 percent of Americans responded that way. In 10 years, those willing to identify themselves primarily as “religious” plummeted by 45 percentage points. In the last decade, the word “religion” has become equated with institutional or organized religion. Because of crises such as the Sept. 11 terrorist attacks and the Roman Catholic abuse scandal, Americans now define “religion” in almost exclusively negative terms. These larger events, especially when combined with increasing irrelevance of too much of organized religion, contributed to an overall decline in church membership, and an overall decline of the numbers of Christians, in the United States. Some Americans want to be spiritually left alone, without complications from organized religion. But nearly half of Americans appear to hope for a spiritual reformation — or even revolution — in their faith traditions and denominations. Congregations that exhibit a vibrant spiritual life embodying a living faith in practical ways succeeding, even in the religion bear market. These sorts of communities are models of what might be possible to renew wearied organizations. But the macro-structures of American faith — denominations — have yet to hear this message. They are still trying to fix institutional problems and flex political muscle instead of tending to the spiritual longings of regular Americans. “Spiritual and religious” expresses a grassroots desire for new kinds of faith communities, where institutional structures do not inhibit or impede one’s relationship with God or neighbor. Americans are searching for churches — and temples, synagogues, and mosques — that are not caught up in political intrigue, rigid rules and prohibitions, institutional maintenance, unresponsive authorities, and inflexible dogma but instead offer pathways of life-giving spiritual experience, connection, meaning, vocation, and doing justice in the world. 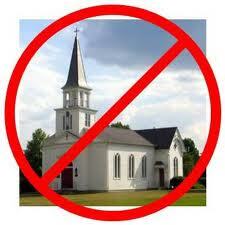 Americans are not rejecting faith — they are, however, rejecting self-serving religious institutions. The end of conventional church isn’t necessarily a bad thing. Christianity after religion, a faith renewed by the experience of God’s spirit, is closer to what Jesus hoped for his followers than the scandalous division, politics, and enmity we have now. Will there still be Christianity after the end of institutional religion? Yes, there will be. But it is going to be different than what Americans have known, a faith responsive to the longings of those who are expecting more spiritual depth and greater ethical integrity rather than more conventional church. Indeed, I suspect that the end of church is only the beginning of a new Great Awakening. Wow, GREAT article. This is really true. I am seeing this happening right now in my community. People nowadays are looking for genuine spiritual “family” where they can love God and love one another.